Built in 1865 on what was then the edge of the built-up area of Birmingham, this church served a rather well-to-do clientele. 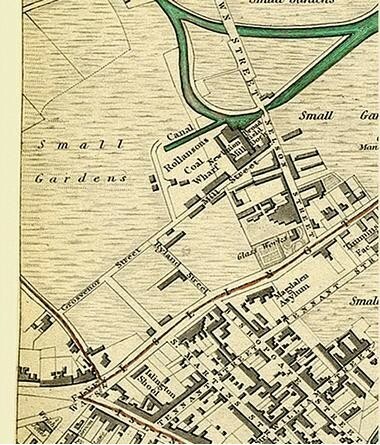 Left: Society for the Diffusion of Useful Knowledge 1839 Map of Birmingham. Image courtesy of the Mapseeker website - http://www.mapseeker.co.uk - use permitted for non-commercial purposes. Immanuel Church was not built until 1865 and is therefore not shown on this map. However, the Magdalen Asylum, the site of whose chapel it was built on, is shown near the corner of Bishopsgate Street. Islington was the name for this west end of what is now Broad Street. Immanuel Church on Broad Street was built on the site of Magdalen Chapel, the chapel of the Magdalen Asylum for Destitute Girls. Set up in a number of large cities, the Magdalens were usually run by the Church of England and provided for young women, often from the countryside, who had been lured to the city by promises of work and then fallen into prostitution. The asylum on Broad Street was established in 1828 and provided for up to 40 residents. The Magdalen Chapel was built in 1839. By 1860 urban Birmingham had spread as far as Five Ways and it was thought better to house the girls out of town. The Magdalen consequently moved to Clarendon Road, Edgbaston. The site of the Magadalen and the chapel were sold and a new church, Immanuel, was built on the chapel site and consecrated in 1865 with a parish assigned out of that of St Thomas', Bath Row. The building was designed by Birmingham architect, Edward Holmes in Decorated style. The west front and small round southwest spire were faced with stone with the rest of the church, which was not visible from the street, being built of brick. The church cost £4600 to build, all of which was raised by voluntary contributions. There were 800 sittings, 600 of which were free. In 1939 Immanuel Church was closed and the parish was united with that of St Thomas’, the united benefice being subsequently known as St Thomas & Immanuel, St Thomas', Bath Row becoming the parish church. However, when St Thomas' was largely destroyed by a German bomb in 1940 during the Second World War, it was decided to reverse the decision. Immanuel was closed and the building demolished after 1964. After the closure of Immanuel, the font was taken to St Mary's Church, Wythall, a church building now no longer in use as such.